Christmas Crunch! 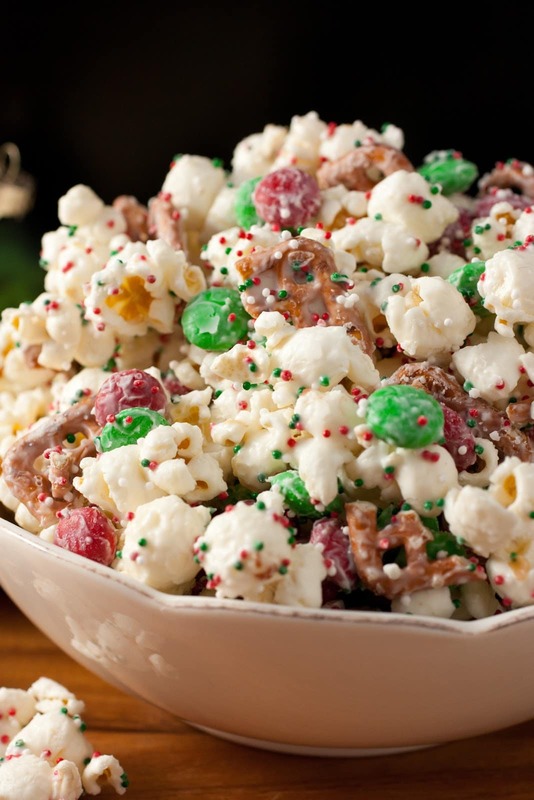 Bring some holiday spirit to your snacks with Funfetti Popcorn Christmas style! It can be whipped up in only 10 minutes and decorated with as many sprinkles as you like. 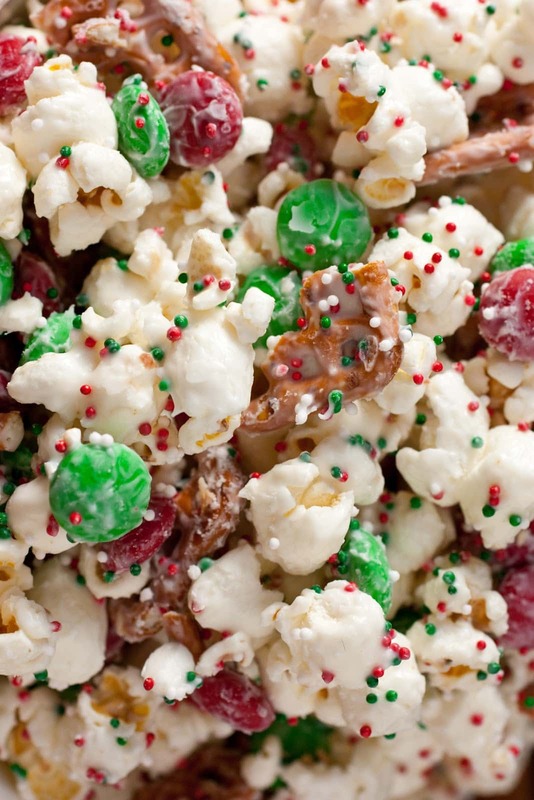 This popcorn treat is perfect for holiday gifts and parties. Easy and festive Christmas treat? Where? I’m definitely in! 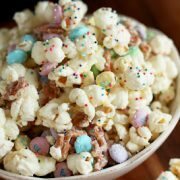 I posted this delicious treat back during Easter time and it was called Bunny Bait. In the post I’d mentioned a few other holiday ideas you could do with the same recipe and here’s one of them. This is one of the best treats ever! I’m so glad Bake at 350 came up with such a simple and delicious idea (such a great blog by the way be sure to check it out). It seriously only takes about 5 minutes to whip up this treat, so wouldn’t it be a perfect gift to give during the hectic holidays? I say it’s the perfect “energy” snack for me during the holidays =). It definitely keeps me going! Just a warning, this stuff is addictive so yes it’s a dangerous thing. Easy to make but hard to stop eating. I want to make it every day. It’s such a versatile snack that has such a delightful crunch. 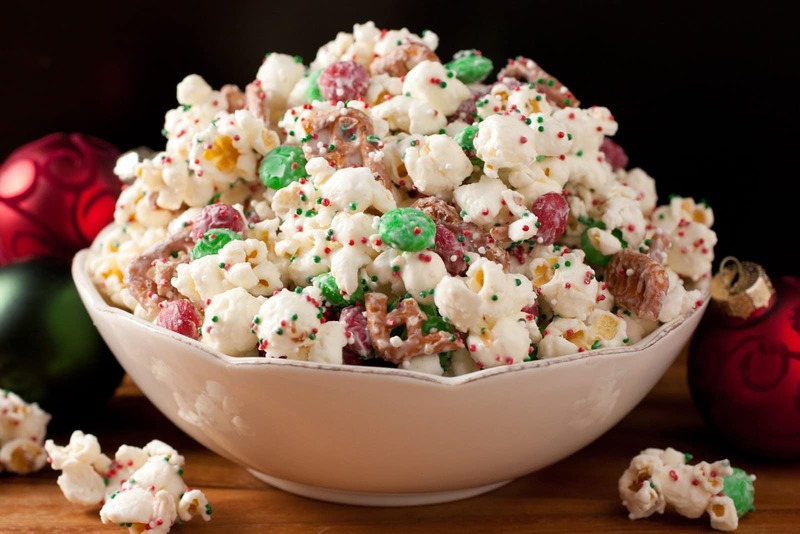 Bring some holiday spirit to your snacks with funfetti popcorn Christmas style! It can be whipped up in only 10 minutes and decorated with as many sprinkles as you like. 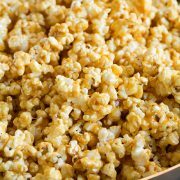 This popcorn treat is perfect for holiday gifts and parties. Melt Vanilla Candy Melts in a microwave safe bowl on 50% power in 30 second intervals, stirring after each interval until melted and smooth. 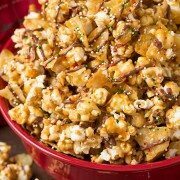 Drizzle half of melted chips over popcorn mixture, then stir, tossing gently a few times with a rubber spatula. Then drizzle remaining half of melted chips over popcorn, and gently stir mixture until evenly coated (don't over stir though or your sprinkles wont stick if the white chips begin to set and harden). Pour mixture into a single layer onto wax paper. Sprinkle entire mixture evenly with sprinkles (as many as you'd like) before vanilla chips set. Allow to cool and harden, then gently break into pieces and store in an airtight container. Note: I was able to fill 8 - 9 1/2"x 4" party treat bags about 2/3 full with this recipe, just to let you know so you have an idea for gift giving.